Our DPA Workstation™ (DPAWS) 8 is a comprehensive analysis platform for the evaluation of device resistance to side-channel attacks, including SPA, DPA, HO-DPA, and EMA. Side-channel attacks are low-cost, noninvasive methods that enable attackers to extract secret cryptographic keys from electronic devices during normal operations. 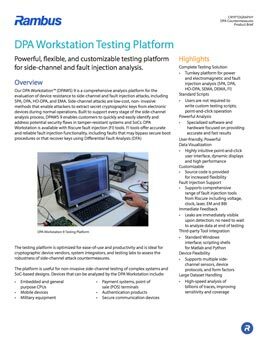 Learn more about our DPA Workstation Testing Platform, and how it enables customers to quickly and easily identify and address potential security flaws in temper-resistant systems and SoCs.